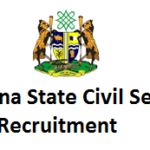 NCS Recruitment Registration Form 2019 Open: This is to inform you that the Nigeria Customs Service Board NCS has began its 2019/2020 Nigeria Customs Service Recruitment. Are you interested in applying for the NCS recruitment? Is the Nigeria Customs Service form 2019/2020 out? Is the Nigeria Customs service form and registration portal open? All these questions and many more will be answer in this post. Yes the Nigeria Customs Service Recruitment 2019 application form and portal is open to all. SUPERINTENDENT CATEGORY – The Superintendent Cadre are senior ranking officers comprising of Assistant Superintendent of Customs. ASSISTANT CADRE CATEGORY – The Assistant Cadre are junior ranking officers comprising of Customs Assistant. All applications are to be made online only on the Nigeria Customs Service Recruitment Portal..
Note– only shortlisted candidates will be invited for the next phase for recruitment exercise.